Chadron State Park is visited by multitudes of big RVs and pull-type campers in the summer. It is getting a good share of its winter traffic this season from other types of big vehicles. They include a Caterpillar track hoe, six-wheeled dump trucks, a Timbco tree feller and a skidder. The big vehicles have been contracted by the Nebraska Game and Parks Commission to renovate the park’s pond and thin trees. The separate projects are expected to be substantially complete in April and make the park more attractive to visitors when tourists begin arriving in the spring. 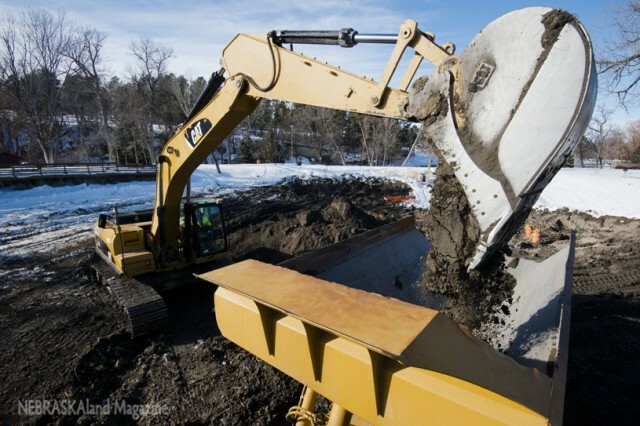 The pond, which was drained for repairs in fall 2013, is being deepened by a contractor. Years of erosion had caused the pond to fill with silt, lessening the water capacity to four acre-feet instead of the 10 acre-feet allocated by the Department of Natural Resources. Even though the pond has been empty for more than a year, navigating the mucky bottom is still a challenge for the big equipment. Construction workers created a temporary road over the muddy surface of the empty pond in order for the dump trucks to pick up loads from the track hoe. Gregg Galbraith, park superintendent, said the renovation will greatly improve the 2-acre pond, which is fed with water from nearby Chadron Creek. The previous depth of the pond’s deepest points was about the same as what will be the shallowest areas after the renovation. When finished, most of the pond will vary in depth from 4 to 14 feet, and a new clay liner will help combat seepage. The dilapidated outlet structure, which prompted the renovation, will be repaired and rainbow trout will again be stocked for anglers. The pond will also be laid out a little differently when construction ends. The plans call for moving the paddleboat boat dock closer to the park’s headquarters from its previous location on the north side of the wooden fishing deck. The new location will be more convenient for both paddle-boaters and staff, Galbraith said. The Timbco and skidder, which simplify the chore of cutting big trees at their base and moving them to a pile, are removing mostly dead and dying ponderosa pines from the park. On Jan. 14, a contractor for Game and Parks began the forest thinning project at the park, which, depending on the weather, could continue through March. The thinning project will improve park woodlands that were struck by wildfire in 2012. Thinning in the park previous to that fire proved valuable as damage was minimized and the flames’ eastward spread was stopped on the property before crossing the highway. Mike Groenewold, Game and Parks landscape horticulturist, said the thinning is occurring on 106 acres near park cabins and other areas adjacent to the scenic loop road. The cut trees are being piled and will later be chipped by a contractor or burned by Game and Parks staff. The Nebraska Forest Service has endorsed the thinning as a “Firewise Forest Wildfire Prevention Project,” and has agreed to fund about 50 percent of the project costs with money available from the U.S. Forest Service. Previous “Babe” Even Fishes Nebraska!